We are blessed to live in the land of sandy beaches, salty ocean breezes and sunshine....well, most of the time...and we'll discuss the hurricanes later. 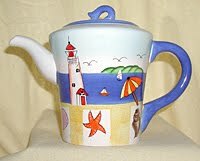 This week's SCS Teapot Tuesday 146 destination is Levvitown, PA and a young man named Anthony. Anthony was hit by a truck one evening after leaving the music store at a mall with his friends. He was very seriously injured and has a long road of recovery ahead. He loves the guitar and the beach. Check out the link if you'd like to send Anthony a card. Here's my card for Anothony. Hope he likes it! Here's the inspiration teapot. I had all those images but chose to focus on the sailboats because I had that cool wave stamp. I stamped and colored one set of waves on my CS then cut out the front set and popped it on dimensionals. The sailboats are heat embossed in white on kraft. The sun is rock and rolled, then clear embossed and cut out, gluing down only the center. The sky is sponged lightly. My friend, MB gave me that cool textured base cardstock so I have no idea where she got it but I LOVE it for this card...reminds me of white sand and that jute..!! I used the sketch from Mojo Monday 191 (MOJO191) I changed the position of the embellishment buttons because I really wanted to use those star buttons and they wouldn't fit in the sketch position. I hope it still counts. The boats look wonderful popped up on the waves. Love the added rope and star buttons! I'm sure Anthony will appreciate your card! wonderful card...love all the details Charlene! A fabulous card and thank you so much for your lovely comments over on my blog...hope to see you again soon! such a great beachy card! Beautiful!! This is simply gorgeous Charlene! What a wonderful card Charlene. No kidding that that is a cool wave stamp!!! LOVE the card, Charlene... Beautifully stamped and designed.